It seems as if Kanye West just can't stay out of Taylor Swift's way. After his posting of another apology for his actions via Twitter over the Labor Day holiday, the singer is accusing West of using her name to promote his new album. According to aceshowbiz.com, a source said that Swift is angry that a year after he hijacked her VMAs acceptance speech, and as he preps a new album, he would mention her… which she feels is for publicity. "Taylor is furious that Kanye keeps discussing the VMAs incident," the source said. "She's fed up of hearing about it and is disgusted that he has the cheek to use her name to promote his new album! Taylor has moved on from the incident and is hoping Kanye will – eventually – do the same." 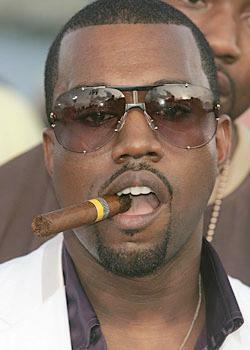 Kanye will be at the 2010 VMAs this year, on stage, performing. He said via Twitter that he wrote a song for the country singer and he'd like to perform it for her. Isn't this the same Taylor Swift that rode said incident all the way to 'Album of the Year' at the Grammys? Hey, she got some shine from it why shouldn't Kanye get some too. I'm not saying I agree with his actions from last year's VMA's, but let's be real. Kanye is a savvy enough business man who knows how to play this game and play it well. You might not like him, but you have to respect the way he keeps his name on your lips. You either have an opinion on him one way or the other and that's exactly how Mr. West likes it.